Actually has dark grey hair, indicating that she's 3rd Generation Beldrobbaen. Being heavily tainted she does not feel emotions or physical pain and her attitude is one of detached logic. Naal tends to focus on the mortality of both herself and others. Her demon seed is a Ver'aku Glutton, and Naal has kept it under control for longer than expected, both due to her extraordinarily strong will, and apparently also due to her interacting with others, which she feels gives her life a reason to continue. Outwardly, Naal'suul may seem dull and boring, but inside the girl is constantly thinking of the future--she is obsessed with what will happen when she succumbs to the unstable demon seed, and when. Naal'suul gives the appearance of a dreary young girl with pitch black hair and heavy belted clothing, a standard uniform for members of her clan. She wears heavy silver jewelry draped across her head and pierced into her nose and ear, and also carries a guardian spider on her back as a means of protection for Beldrobbaen children. After her demon seed was released upon her death, Naal'suul took on the appearance of the demon: the lower half of her body merged with the mass of dead bodies the glutton demon consumed and over time that mass transformed into a large ver'aku with a gaping mouth and red gleaming eyes. However, strangely the top portion of her body stayed in its original shape for unknown reasons, although Kiel'ndia theorized that because Naal'suul retained some sort of consciousness--enough to save Kiel from being eaten--the top half represents Naal'suul's will to remain in control of the demon for as long as possible. Naal'suul's top half matured during the 15 years of isolation and now sports demonic eyes: completely red eyeballs with white circles in the center of the eye. Naal'suul, Kyo'nne and Shinae ready to assist Chrys'tel. Naal is among the group of girls that discover what appears to be Faen'arae Val'Sullisin'rune but is actually Ariel Val'Sarghress under a shapeshifted disguise, in an attempt to lure Chrys'tel Vel'Sharen away from the group. She cuts through the bickering between Kyo'nne Val'Illhar'dro, Shinae Vel'Sharen, Kiel'ndia Vel'Vloz'ress and calls the girls to action in order to save Chrys. But before anything could happen, Chirinide Val'Kyorl'solenurn arrives to attempt to detain all of the tainted girls present. Naal'suul quickly escapes using her illusory Shadow Sorcery. When the girls put enough distance between themselves and the young Warden, Kiel confronts Shinae about throwing Kyo'nne to the Templars to save herself. Shinae attacks Kiel with her sorcery, but Naal'suul puts herself in between the two and blocks the attack. After Shinae leaves, Kiel announces that she needed to head back to her clan fortress and suggests that Naal not follow her--to this, Naal'suul only replies that she does not want to be alone, but she understood the situation at hand. 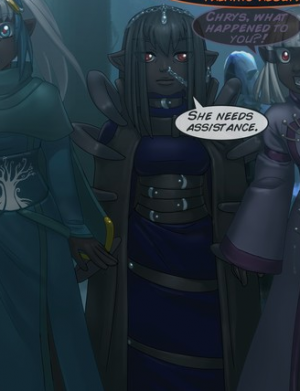 At a defaced statue of Sharess, Naal'suul starts to talk to herself about how every major connection people hold with one another is starting to fall apart through the killing of one another, and that the drow race is lost. At the Beldrobbaen fortress Naal'suul is laying in her bed but is restless and unable to sleep, her thoughts turning to her only friends who seemed to have deserted her: Chry'stel and Kyo'nne both being kidnapped, Kiel and Shinae going their own way to their respective clan homes. She muses to herself about the demon inside her that is equally restless, and of her tainted friends and how long would they live until they could no longer control their seeds. Naal'suul wonders what it would be like if she fell from her balcony-would she feel pain at all? Would it even matter? Not even the Vloz'ress demon messenger from Kiel could answer her questions, but the letter speaking of demons and saving Kyo'nne piques her interest, and the girl gets ready to head out. She is stopped by Khal'harror who eagerly wants his sister to see something cool (Bob 2.0), but Naal'suul has other things to worry about and says that whatever she does not won't matter in the end when she is gone. In an attempt to cheer her up, Khal declares that when she dies, he will reanimate Naal again. The two are interrupted by their mother Waes'soloth who warns Khal that he's better get to class before the gates close. The Illhar'ess inquires about Naal'suul's health and asks if she wanted to be free of the demon, but Naal'suul is determined to stay by Kiel's side for as long as possible. During a dwarven attack on the Sarghress caravan escorting Ariel, Kiel and Naal use the opportunity to confront the younger girl and rescue Kyo'nne from Chirinide. Kiel declares that it's payback time and wants to kill or taint everyone, although Naal'suul thought it was just a mission to save their friend. While Kiel engages Chiri, Ariel attacks Naal'suul with mana bolts, but she is thrown into confusion at the illusory images Naal conjures with her shadow sorcery. The Beldrobbaen uses this opportunity to share Ariel in shadow and interrogate her on Chrys'tel's whereabouts, adding that if the roles were switched, what would happen to Ariel if Naal turned her in to the Beldrobbaen Illhar'ess to be tortured for her crimes. When Kyo'nne screams for everyone to stop, it is Naal's voice of reason that tells Ariel to listen for the sake of the wounded Vaelia. She also moves to stop Shan'naal's sword from striking Kiel--with her bare hand--and grabs the drowussu boy's wounded arm; she warns that the pain he feels means that he is still alive, and that her friend Kiel feels pain just as he does. With the conflict resolved, the two take it upon themselves to tag along with the caravan. At Machike'Shikumo Naal'suul listens to Kiel and Chirinide's amusing bickering about drowussu and purity for the goddess--she thinks what Chiri spouts is the result of indoctrination. She and Kiel see Kyo'nne off and Naal takes the time to tease Kiel for her lack of proper manners when Ariel allowed the Vloz'ress to see Sene'kha in her jail cell. Naal observes from a distance of a standoff between resident Sarghress soldiers and Kyorl troops under the Order of the Holy Eye. Kiel then asks if Naal had the choice to control her demon seed or ensure her family's survival, what would she have chosen, and Naal's immediate answer is to save her family because she fears that she has one foot already through the door to oblivion. The Vloz'ress argues that her friend still has a chance to be saved, but Naal'suul disagrees and explains her situation: to the Beldrobbaen, being in this condition is like being sealed in a cell with only one way out, and that way leads to the demon that tainted her. The cell is dark and cramped and she is constantly aware of the demon trying to force itself into her cell. Naal'suul fears that there will be a time when she slacks on her guard and accidentally lets to demon through. Later, the two go to witness Sene'kha's death at the hands of the Kyorls. The children are not quite finished with their journey, and head for the edge of the Nidavellir to glimpse one of the Overworld's moons at night. The pair have a moment to joke about their conditions with family and the world, and how different their personalities are. Kiel speaks of Sene'kha's true plan, which was to go on a search for a demon god's last shard and unleash Kharla onto the world, causing chaos and ruin in the population. Kiel is determined for this not to happen and she wants to become a hero and save the world with Naal'suul, saying that it's better that the two tainted children do something versus ending up in some Kyorl's sealing gem. Naal thinks Kiel is completely weird, but she goes along with the Vloz'ress' plan and will stay at Kiel's side until the end. Naal and Kiel make their way through the insane Vloz fortress. The two are now back in Chel'el'sussoloth after having caught a trader back home, and Kiel is determined to end what Sene'kha set in motion, but Naal'suul asks where to take the first step. The Vloz'ress then launches into a monologue about how she plans to kick the asses of the nether summoners in her clan and how cool it'll be to become a heroine and have all the princes she wants.. but Naal'suul has wandered off to a food stand, much to Kiel's dismay. She offers her friend a bite of her potato bug kebab though Kiel refuses. Kiel thinks there is someone pulling the strings behind Sene'kha's plan and encouraging such a catastrophe to happen, thinking it might be the Nidraa'chal clan survivors that might be using her clan as a cover to operate undiscovered. Naal'suul joins Kiel at the Vloz'ress fortress where she glimpses an arena brawl between two hopefuls looking to join Nyo'ka Vloz'ress and her gang--Naal'suul questions the reasons for someone willing to go through these dangers, considering the risk involves death or even enslavement by Vloz'ress naga biogolems, and Kiel's response is that people are so desperate for status, food and even a roof over their heads that they'll do anything to get it, even join a clan like the Vloz. Naal then asks whether or not Kiel minds the rude comments from the residents of the Vloz fortress, and Kiel does, but she just didn't feel like kicking them at the moment. 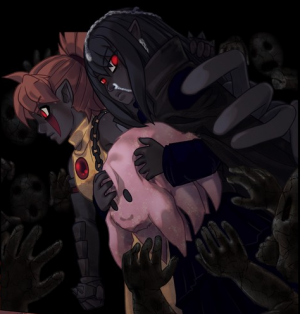 The two make their way through a strange hallway filled with shadowy dolls that try to grab at anything in reach, through a door with a golem guardian mounted on it that Kiel calls "mom", passing two rolls of what appears to be dolls that moan in agony, and finally ending up in a throne room where Kharla is waiting. She demands new toys from her maidservant, an old rift halme named Nainai. Upon seeing Naal'suul, Kharla snatches the Beldrobbaen up and hugs her like a doll; Naal is further subjected to abuse by being forced to take a bath with Kiel and Kharla. She is amazed at Kharla's childish behaviour, not expecting an Illhar'ess to be this way. When Larvova Vloz'ress confronts Kiel about Kharla's behaviour and the dangerous power game Kiel is playing, Naal'suul pretends to be a lifeless doll to avoid detection by the rival gang. After the incident, Naal'suul beleives that Larvova is right in that Kiel cannot control the unruly Vloz'ress by herself, and needs allies. At this, Kiel'ndia is reminded of an old friend of her mother's, a golem engineer named Kar'liir Vloz'ress. The two head for the basement of the Vloz'ress fortress to meet the male, who is unwilling to help the young Vloz'ress initially, but after some convincing Kar'liir suggest starting with using naga biogolems that he can make. At the end of the day, Naal'suul is sleeping alongside Kiel in Kharla's bedroom, feeling extremely tired; Kiel insists that she at least remove the doll costume but the belts make the girl feel safe and secure, as if they hold her together. She requests that Kiel bring her more belts tomorrow so that she may sleep. Instead, Kiel draws the girl closer to her and asks to be her belts and Naal'suul relents, drifting off to sleep. But only for a moment, before she is woken up again by her fear of death for sleeping too long, but Kiel is there to calm her down so that Naal may finally rest. The prospect of being transplanted into a Jaal'darya-made body. Chrys'tel and Shinae visit Naal'suul at the Beldrobbaen fortress, where she brought Kiel along. Naal'suul had to force Kiel to look pleasant and decent while in her clan's home, because Kiel standing out so drastically was a huge insult to denizens. She dressed Kiel in a style fitting of the clan and the two visiting Sharen couldn't have found Kiel to look any more ridiculous, bursting out laughing at the Vloz'ress' expense. Chrys'tel has come to tell her two friends that she sense something is amiss: through her time with Sil'lice Val'Sharen she learned that the Val'Sharess tower was in ruins and that she believed the Imperial queen was dead. Furthermore, Chrys was told to investigate the bottom of Orthorbbae to discover something equally as terrible as Diva'ratrika's murder. Naal'suul finds it hard to believe that four little Val girls could make a difference if what she said was true. When Shinae leaves to go off on her own, Kiel breaks the news to Chrys that her protector twin had been trying to take her place as a daughter of Zala'ess, hoping that Chrys had died at the Sarghress fortress. Naal warns Kiel to stop instigating trouble, and wants her friends to let go of their grudges so that they all make it through the chaos alive--they were friends, even if they were from different clans. She then encourages Chrysand Kiel to speak with Shinae so that she may meet with her mother, who was listening to the group from the shadows. Waes'soloth mentions that it's hard not to overhear childrens' chatter in the halls, and at her daughter's questioning the Illhar'ess replies that it's likely true about what happened to the Val'Sharess, but none could prove it without evidence. Next, Waes'soloth says that envoys from the Val'Jaal'darya clan have told her that they could transfer Naal'suul into a new body, free of the taint. Naal questions if that were even possible, and Waes confirms that if it were, then Sharess wouldn't have had to sacrifice herself to save her people. Nor would the Beldrobbaen have had to lose their homeland. The Illhar'ess believes there is no cure, but there is still a chance, but Naal interrupts her with the reality of knowing that she is lost, and tells her mother not to let the Jaals control Waes through her. The Illhar'ess smiles and sees her daughter off with the message that she will be sending the Jaal'darya back missing a few limbs. The four children tour the city streets during the Moon's End Festival, with Naal'suul buying a Vel'chahal doll for herself. She also rebukes Shinae for saying how demons can wreck the Illhar'dro summons with the belief that summons had feelings and that they might be the last of their race--her question to Shinae is that what if a summon could talk, and shinae shuts down the notion that a summon ever could do so. The group heads for Orthorbbae and are met by Chrys'tel's and Naal'suul's brothers, Khal and Nau'kheol Vel'Sharen who want in on the girls' plan to search Orthorbbae's depths. However since there is a strict rule of no males inside the girl's section of Orthorbbae, Naal'suul has a little fun dressing her brother up in her old clothing, earning a scowl from Khal. She later collapses from exhaustion as the group moves further into the girls' section, and she claims that she could not feel her limbs so maybe she has stumbled on something (indicating that the taint sickness was advancing due to its ability to dull pain). At the sealed door with Sharess's chained body carved into it, the group finds that Chrys' sharen keystone does not work on the door, nor does Zala'ess'. Naal'suul suggest that the only probable answer be that only Snadhya's crown could open the door. Kiel hatches a plan involving Naal'suul pretending to loose her demon seed just enough to call out Snadhya from her quarters and cause a scene to allow Chrys to sneak in. Although the plan worked, Naal'suul could feel that she went overboard with the acting when her heart stats to beat fast and she falls over beside Khal'harror. Snadhya arrives on the scene and seals part of Naal's excess nether into a gem in her crown and offers her assistance should Naal'suul need it, suggesting that with Waes'soloth's cooperation Naal'suul could get sealing armor to stave off the taint sickness. Back at the carved door, Chrys'tel's stolen keystone successfully unlocks the door and the children are met with a blast of cold air from an abundance of ice foci in the room, even before they could fully open the door. What they find inside is a morgue-like room where several cold bodies of many teachers lay. Suddenly, a woman emerges from the back of the room with the intent to kill the children for trespassing on restricted property. Naal'suul is stunned when she sees the recognizable aura of her former teacher, Sate'ja Vel'Sharen, and the teacher comments that the Beldrobbaen was always her favorite student. Chrys'tell tries to convince the woman to turn away and not attack fellow Vel'Sharen, but Sate'ja merely states that she no longer belongs to a clan, and that she must kill the intruders. Naal's final words to her friend. Six against one, yet the children are unable to take down the teacher wielding ice sorcery and nether against them. They all struggle to stay alive under her assault even when they attempt to go at her from multiple sides. Naal'suul attempts to attack Sate'ja with shadow sorcery while Nau and Kiel are on her, but the teacher is too fast for her, snatching Nau's sword and impaling through Naal's chest with ease. In her death throes, Naal'suul bids her friend goodbye and releases the Glutton Demon that had been waiting to get out of her for so long, and her friends can only stand and watch helplessly as the demon takes conrtol of Naal and consumes the drow summon of Sate'ja and all of the mana in the room. Chrys'tel uses the diversion to get everyone out of the room, and Kiel's last glimpse of Naal is of a beast with red demonic tendrils merging with the body of their teacher and eating even the summon's tainted aura. Some time later, Kiel is determined to see if Naal'suul still exists within the twisted body of the glutton demon and enters the depths of the school once again, bringing the body of a dead scourge to feed the demon. She lures the demon out into brighter light with the body, but it moves on its own towards the door revealing a horrific conglomeration of Naal'suul's top half and the merged bodies of the dead teachers beneath her. Kiel is extremely apologetic about failing to save Naal, and admits that she cannot continue on as she is with the mess she's created. She feels that the evil doers in her plan to save the worlds will screw everything up no matter what she does. She draw closer to the demon and asks it to eat her. Khaless speaks of how Naal'suul and Kiel are the future of the Ver'drowendar race. But the demon grabs onto Kiel and shoves her out of the room and starts to close the door on the Vloz'ress. A shocked Kiel realizes that Naal'suul is still is still inside that demon somewhere because it chose to spare her (and even stops Kiel from coming back inside the room)--Kiel promises to keep coming back to see the demon and keep feeding it dead bodies so that one day she could find a way to get Naal'suul out of Orthorbbae. Naal'suul still remains inside the bottom of Orthorbbae 15 years later, although Kiel has kept her promise of feeding her bodies. Upon opening the door, an older Naal'suul emerges from the darkness, filthy and even larger than before. Kiel admits that although she successfully took control of her clan and has started kicking asses around, she regrets that Naal is not there beside her--she still feels that she failed her friend. The demon reaches out for Kiel in response, while top portion of Naal's body clings to the Vel'cahal doll she bought all those years ago. Kiel comments about how much she loves the story of Vel'cahal, and the demon Khaless Sharen emerges from behind, commenting on how the story of the male who aided Sharess is so very similar to Naal'suul's own fate. The vel'akar points out that Naal'suul will one day grow too big for the pit, just as Kiel launches an attack against the deputy headmistress. Khaless easily holds off the combined might of Kiel, Sindas and Bast and instead mentions that she is not here to fight, and tht Kiel should be grateful that she and Snadhya'rune turned a blind eye to Naal's plight for so long. The demon is delighted to see how Kiel's taint has developed into the Friend Demon and that she and Naal represent the future of the drow race as she believes that their merging with their demons in different ways is a perfect form of tainting. "I know how the undead feel." -writing on her bedroom wall. "I can't.. I CAN'T! I don't want to die. I fear it: oblivion. I don't have long, I know it. Either it will devour me or I'll die. Either way, I'll cease to exist." -to Kiel when she is unable to sleep. Concept art of Naal'suul during Arc I. Official concept art of Naal, Chapter 50. Concept sketches of Naal, Chapter 55. This page was last modified on 6 April 2019, at 01:37.